I’m not exactly sure what I weighed last week. I only had one day back at home between my trips to New York and then to Minnesota. I was at my parents house on Thursday morning and didn’t get home until 3:30 a.m. looking for last minute pictures for a video I was putting together with my brother for my parents anniversary. Staying up late wasn’t hard but, getting up an hour and a half later at 5 a.m. was a bit of a challenge. So, I’m at 252.0 right now which is the same as my average weight for April. I think, with some of the DietBets I have coming up that I may still be able to end up with an average weight in the 240s, especially since on the first of next month I need to weigh around 239 for Round 3 of a DietBet. Biggest thing on my mind right now is West Virginia. In about 20 hours I’ll be heading out for that state and I’ve got plenty to do before then. I’m on to Plan B with my Marathon Maniac (MM) pursuits since I was yanked from the Starved Rock marathon at mile 12 due to thunderstorms. Plan B is completing 3 full marathons in 90 days and the Hatfield-McCoy marathon will be #2 of 3 necessary for joining the MM’s. Lately, I’ve become enamoured with runs offered by a website called mainlymarathons.com They help people knock out series of either 5 or 7 marathons or half marathons in 5 or 7 days, respectively. 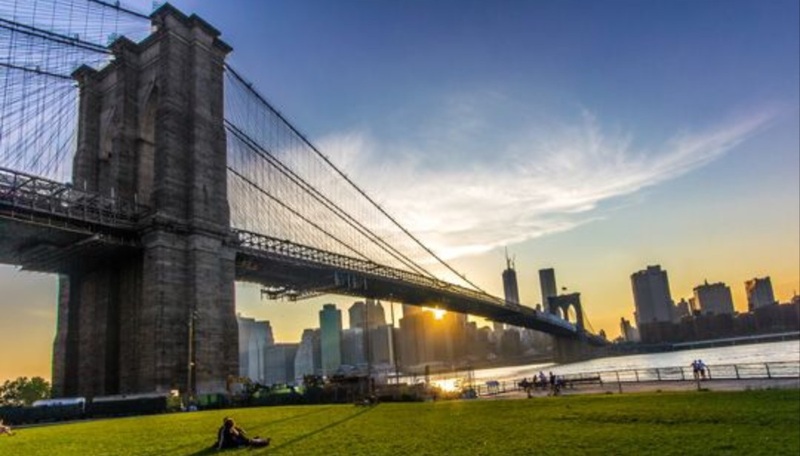 There is one 7 day series in the New England states next year – May 15-May 21 which cover the states of Main, New Hampshire, Vermont, Massachusetts, Connecticut, Rhode Island and New York. 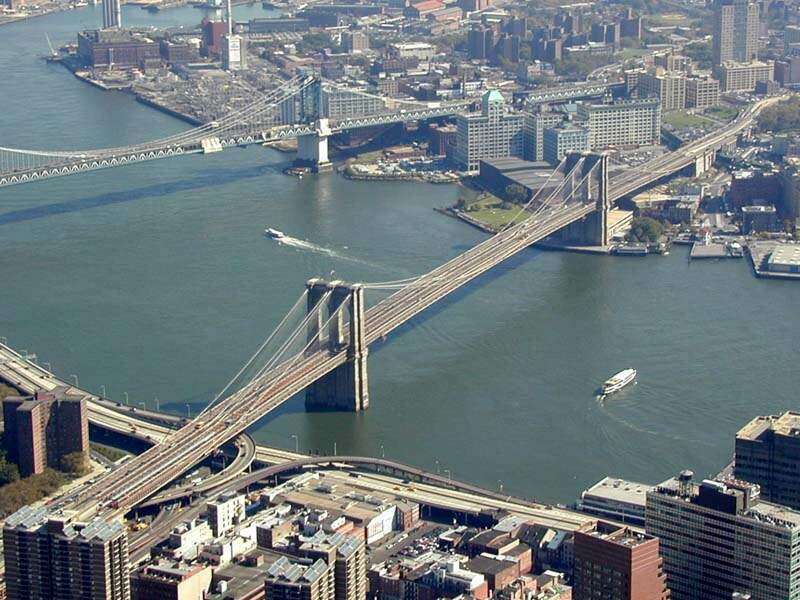 I’m already signed up and registered for a half marathon in Fisher, Indiana on the 21st but, I won’t need to run in New York anyway since I’ll be checking off that state with the upcoming Brooklyn run later this year. For now, it’s been fun to plan out. It would consist of 2,818 miles of driving to knock out 91.7 miles of running in 7 days. That’s the New England Series. I haven’t done any planning for 30 states but doing the series and ones I’m already signed up for would give me 13 states in two months. I currently have one night booked in West Virginia prior to the run on Saturday morning but, there is a Double Agent (HF and MM) who is the president of the local runners club as well as a fireman and I’ve shot an email out to him to see about maybe getting a cot to sleep on Saturday night at the firehouse in either Williamson or Belfry Kentucky. Even the night before the marathon there is a bon fire at a local park in West Virginia until 10 p.m. as well as a pasta dinner that same evening from 5 to 7 p.m. There is a meal ticket for after the race and then a pig roast Saturday evening as well. running short on time here but, it looks like I’ll be shooting for another 240s month as my average weigh in for June then either a low 240s or upper 230s month for July. Those full marathons are such a different kind of beast with so many physiological and mental aspects to them that it’s a bit difficult for me to make super accurate predictions and isn’t really a time for any new extreme weight losses to occur. I just don’t have sufficient knowledge or experience to know with any high degree of confidence exactly how things will go. We’re down another 3.2 lbs from last week and down 8.8 lbs from two weeks ago but don’t begin to think that’s anything miraculous. We need to keep in mind that my weight went up two weeks ago and the week before that I was at 267.6 so we could also say I’ve lost 3.6 lbs in the past 3 weeks. It’s a perspective thing. Too many people trying to lose weight are short-sighted – nearsighted or live in a constant state of myopia – they only see the short term and not the big picture. Weight loss is not linear, it does not follow a straight line. If we had an accurate enough scale, we could probably record weight changes by the second and certainly by the minute. Hourly our weight will change, daily and certainly weekly. I have my averages for each month in my Running Log tab and for March we’re at an average weight of 268lbs so I’m down 4 lbs from last month’s average. As an instantaneous snapshot of weight, the 264.0 represents a weight that is less than my average for all of last year so, we’re moving in a good direction. Current efforts which include the same kind of effort that was put out during the week when weight was gained are bearing fruit and should be maintained and continued. In all these DietBet’s I’m in there isn’t a day that goes by where somebody isn’t lamenting the fact that “they gained a pound this week” It’s like the 12 or 15 lbs they lost over the preceding 6 week’s no longer matters. It’s a crappy way of thinking and an attitude that is detrimental to any long term plan of success. That mental attitude and the psychology behind it is probably something that needs to be changed and worked on more than the diet and exercise aspects if any real success is going to be achieved. Mentally fertilizing and growing the perceived failures while ignoring the success and what’s working only heightens the probability of quitting while diminishing the likelihood of continued, long term efforts. Right now I’m 5 for 5 with my DietBet’s and only need a weight of 264.3 for this Saturday’s weigh in so it’s looking good for going 6 for 6. The following week I’ll need to reach 260.2 in order to win my $100 monthly bet. For now, I’m well ahead of the game compared to last year when I didn’t have a single recorded run until March 26th and, as of today, I’ve managed 18 runs totalling 52.5 miles. We’ve got a local 5K coming up this Saturday and then the much awaited Bridge & Dam 10K the following week at the Lake of the Ozarks! The following day – on Sunday, April 26th is very interesting to me. There’s a Duathlon consisting of a 1.5 mile run then a 10 mile bike ride then another 1.5 mile run. The shorter distances make it ideal for a newbie like me. I don’t recall ever doing a multiple sport event before. I think it would be a neat challenge to knock out a half mary the day before in Nashville then get up the next morning to another event like the duathlon. Right now, the local 5K doesn’t increase in price until the 10th of April so current thoughts are to make a more informed decision after the Lincoln Presidential Half on April 4th. 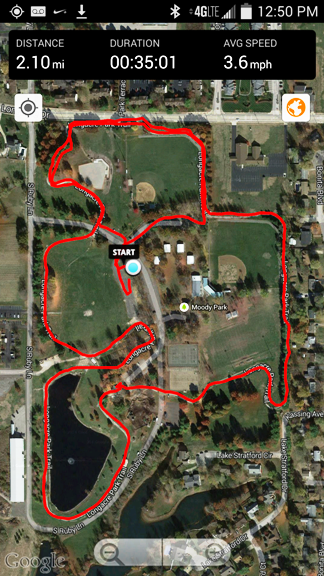 One amazingly cool run is the Moonlight 1/2 in Springfield, IL – it is entirely run in the 300+ acre cemetery where President Lincoln is buried. If you’re running the full marathon then you start when you want and the winner is the person who finishes closest to midnight. That might be a neat way to get in my 3rd full marathon since time isn’t much of an issue – just endurance. No GPS or phones are allowed on the course and everyone wears a glowstick around their neck. 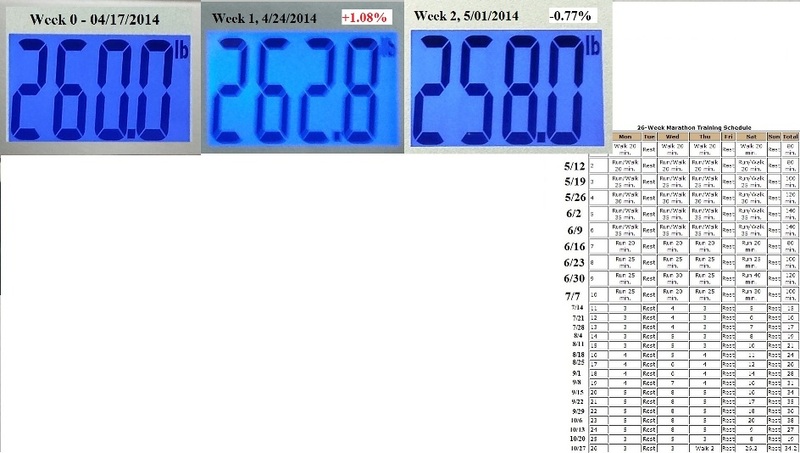 This week, we find ourselves at the lowest weight of the year so far, 267.2 pounds. That’s a 5.6 pound drop over last week which can be typical following a week where the weight has gone up. That 267 lb weight has been pretty stable and is exactly what I weighed the day before this week’s weigh-in. Today (Friday, 3/13) I actually weighed in at 256.8 lbs which is good since I need to be at 264 next week and down to 260 the week after that. As you may have noticed above, my official HealthyWage prize banner has changed from it’s original $2036.00 base prize to a new total of $2096.00 because I’ve had 3 people click on my link and sign up which has added $60 to my potential prize. Saturday 10/24 – 5K Monster Dash – reg not avail. pending. The Macklind Mile registration became available so I got signed up for that so I only have two bike rides and two more runs where registration is not available. I’m not sure if the 5K Monster Dash will be an option unless it’s held a week earlier due to scheduling conflicts with my Part IV board reviews. The SLTC 1/2 is the longest running 1/2 marathon in St Louis and I wouldn’t mind doing that again. Mainly, I’ve been looking at more runs – a few notable mentions would be the Country Music Marathon in Nashville TN. As a single race, it’s very pricey with a current going rate of $125 and that’s a bit to wrap my head around. However, the Rock n Roll series has what’s known as a Tour Pass available for $199 that entitles a person to run in any 3 Rock n Roll events. There is also an extra fee which brings that price closer to $210 but that still comes out to about $70 per run which is easier to swallow than $125. However – getting that Tour Pass also opens up the option of partaking in two additional RnR 1/2’s this year and in addition to Nashville, I may opt or the Chicago 1/2 which also features the Remix Challenge which means I can run a 5K the day before the half, as well as the 1/2 the next day – this gives participants a total of 3 medals. One for each of the races as well as the bonus Spinning Medal showing you ran in the back to back races. There we go – 52 weeks worth of weigh ins, starting Monday, January 13th, 2014 and ending on Thursday, January 15th, 2015. …thought i’d throw this blog up during halftime of the Hawks vs Packers game… didn’t happen – under 2 minutes left in that game – freakin’ game of the century here – holy cow! … …OT! After that initial Monday weigh in all subsequent weigh ins were on Thursdays. Week 32 was the last time I weighed under 260. From week 33 to 45 I stayed in the 260s. Battery started going out in Week 46 and was dead in Wk 47. Week 51 I totally forgot and had to do a catch up weigh in two days later on Sat. Anyway – looking forward. I really like how Kyle, who post under Running Large, has running odometer’s for each month of the year dating back to January of 2013. 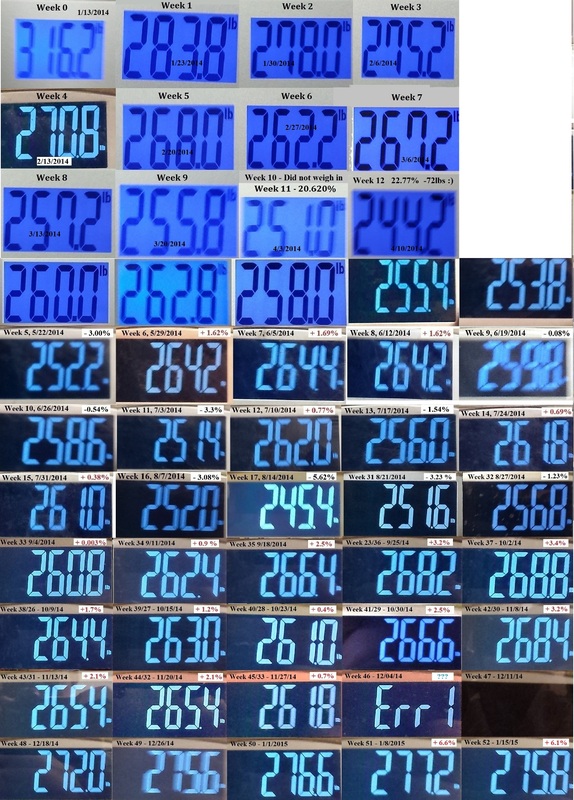 I’m going to update my Running Log tab to show an Odometer for 2014 along w/ my corresponding average weight for each month. 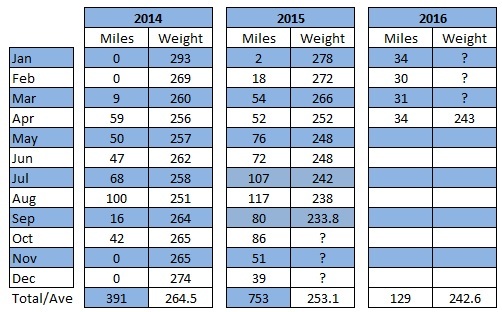 Below that Odometer table, I want to have a table comparing last years runs to this years runs. I’m currently signed up and registered for 3 runs in 2015. Two 1/2 marathons in April and the Rock n Roll 1/2 in October – all runs I’ve done in 2014 so I’ll be able to compare my 2015 times and compete against myself. Beyond those two, I definitely want to do the Macklind Mile again as well as the Go! St Louis All American 5k – the best 5K I’ve ever run. For 2014, I ran in 13 of the 14 runs I’d signed up for. 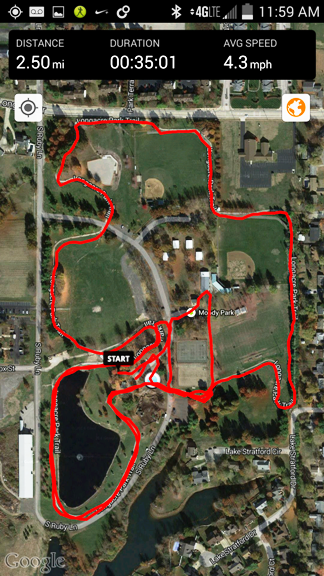 …3 of those “runs” were actually bike rides – Tour de Belleville, Tour de Donut and Moonlight Ramble. I’ve gotten rid of two of my tabs – the music tab is gone, with several hundred pieces of music on my phone it’s not much of an issue anymore and I don’t need last years marathon training plan but will need something for the 1/2’s coming up in April. 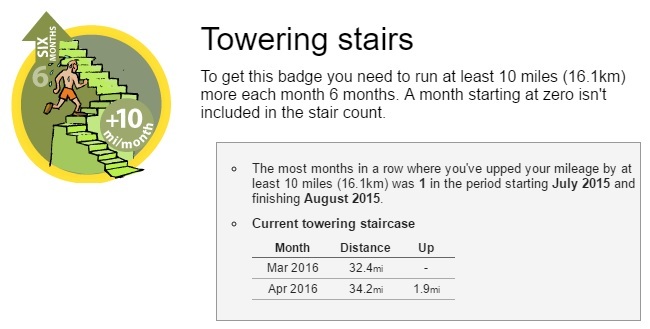 I did virtually nothing for those runs last year except a lot of walking leading up to the runs so it should be pretty easy to beat last years mileage for the beginning of 2015. OK – I also need to blog at least once a week, at least for each of my Thursday weigh-ins. I’ve already looked up several runs while writing this blog entry and that’s something I haven’t done for a couple months. The Nashville CMM is $120 for the half – kinda high. But, the Las Vegas RnR half is sitting at $99. Mainly, I need to do this for overall health reasons but, it’s a bonus to make it fun 🙂 So …looking at a sub 3 hr half, low 240s bodyweight, sub 10 minute mile and another 100 mile month. Vegas is interesting. The first time I ran a 1/2 there, it started at 6:30 a.m. and went up the strip (North) starting at Mandalay Bay then back down west of the strip via Industrial Rd and Frank Sinatra Dr. There wasn’t much to look at on the way back. The course in 2015 still starts at Mandalay Bay but, heads South until about even with the Southwest corner of McCarran International Airport then heads back North for about 8 miles then comes back South along the strip and ends at the Mirage. Oh, it also starts at 4:30 PM Sunday – very different. Registration for the 2015 Country Music Marathon in Nashville Tennessee on April 25 is now open! Click on the bold faced underlined link and use Code ROCKCMM15 to save $15. That code is good until 11:50 p.m. on July 25th so, not much time. The regular price is currently $90 for the half marathon and $95 for the full marathon. The Rock n Roll series runs are not cheap but this one was a blast in 2014 and I have nothing else planned in April of next year so I’ll probably sign up. I’ll have to get to a track by the end of this month to see if I can improve upon that time. July has been a bit different. My average distance is over 2 miles more than the previous month and Average Duration has also increased by over 1/2 hour. So far, the average of my fastest miles for each training run is under 14 minutes as well, coming in at 13:41 per mile. I almost feel a little desperate to see those numbers drop faster because of the impending Marathon on November 1st. I often do calculations throughout the day and, for easy figuring, I look at this last 10K and to make the numbers nice think about 6 miles in 1:15 or 12 in 2:30, which means 24 miles in 5 hours. That’s a heck of a long time and I scarcely have any runs beyond the 6 mile range right now. The 35 mile bike ride took the place of an 8 mile run but, I do have 11 miles scheduled for this coming Saturday and I’ll have some help from the Rambling Walkers – whoever they are 🙂 It’s at Babler State Park in Missouri so I’m sure some hills will be involved. At least I’ll get it done early. I do want to have a bit of a strategy in place and might brush up on the Gallaway strategy of walk/run to help me get through it. I want to be better than I was 20 years ago and I think that’s possible in terms of running. That reminds me again of that quote by Bill Gates that most of us overestimate what we can do in a year and underestimate what we can do in 10 years. I need to get through this upcoming Marathon, it’s not something I take lightly. Even with that 2015 Nashville run I mentioned earlier, I’m only looking at the half marathon. Longer, Faster – & my Weigh-In Wallpaper! I’m in week 4 of my 26 week training program and completed 3 out of 4 of the needed runs this week. Monday and Wednesday were pretty much the same, running 2.1 miles in 35 minutes. On Thursday, I wanted to do better and after my first 5 minute run/walk interval I deviated from those 5 minute intervals for the first time and ran more when I felt like it as opposed to what the clock said. The result was a 19% improvement in distance over the same amount of time and can be seen in the following two screenshots from my phone. Both of these workouts include a five minute walking warm-up then 30 minutes of running & walking. The slower one is with strict adherence to jogging the start of each 5 minute interval and walking the balance. The second was more free-flowing, running as I could and often involved not waiting an entire five minutes before starting to jog again. In a way, I’m constantly on the lookout for improvements, anything to help bolster a belief that I am improving. I will continue to have faith & trust in myself and the program I’m using. I guess I have enough experience to know that improvement doesn’t always follow some theoretical linear fashion and there will be ups and downs but, overall, given enough time there should be a trend upwards. Fits & Starts is one way I’ve seen improvement talked about before. Weeks 5 & 6 of this program are the same and both consist of 35 minutes of walking and running. I suppose, in the beginning, having 5 minute intervals where I run as much as I’m comfortable with then walk the balance of five minutes is a pretty safe and comfortable way to start out. Oh, there was something interesting I noticed when coming to the last five minutes of yesterdays run – I was a bit sad that it was coming to an end. That is quite a contrast from the 15 or 20 minutes I sat in my car before the run, when I was simply procrastinating and putting things off, even pondering going home first to get a bite to eat. I’m glad I stayed and accomplished what I did. I’m hopeful with the extra 5 minutes in weeks 5 & 6 that I’ll be covering 3 or 3.1 miles by the end of week 6. I’m also hopeful because the 26 week countdown to the marathon doesn’t start until this coming Monday, and I’ll have already finished 4 weeks of the program. How I end up at the end of week 6 will determine if I move on to week 7 which consist of straight running for 20 minutes on all four days of training or, if I will add week(s) to the program to continue to do what I’ve been doing to allow myself to build up to the 20 minutes of straight running, if necessary. At least for this one workout yesterday, I was able to jog more and walk less and on another workout prior to Nashville, I jogged for over 5 minutes, non-stop. while I’m here I should get my wallpaper posted to help with my accountability. The 12 week contest ended on April 10th, finale was on April 12th. 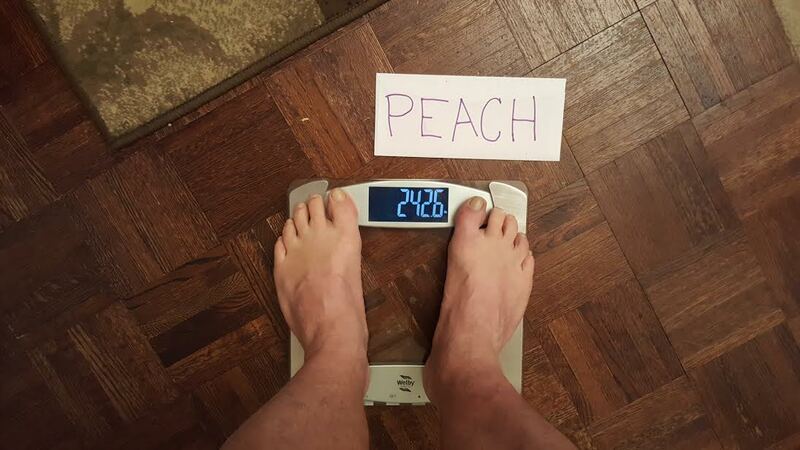 On Thursday, April 17th I got a new starting weight for myself. The contest ended with me going from 316.2 down to 244.2 but, there was plenty of fluid loss in the last week so it wasn’t a very real figure to start from plus, I had a jar of peanut butter and a few other things waiting for me that I wanted to eat after the contest. All told, I’m starting my 2nd 12 week session with a weight of 260.0. I went up 2.8 pounds after week 1 and then down to 258 for my week 2 weigh in.